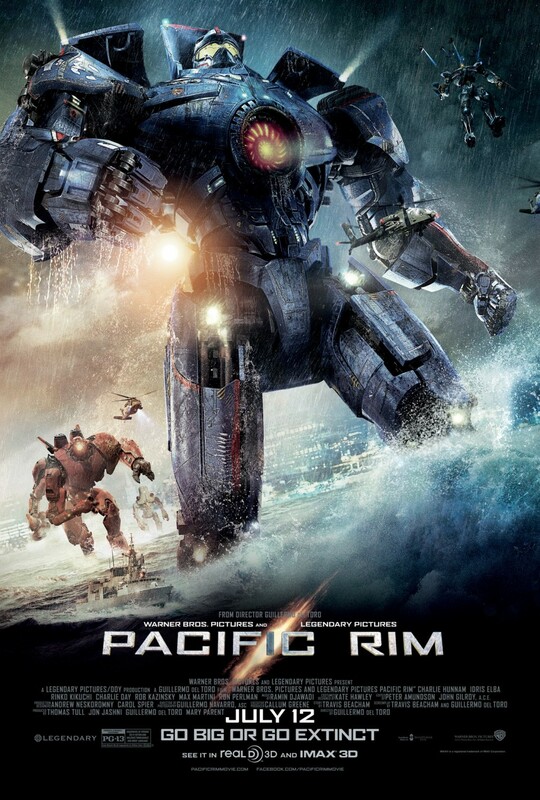 Home » guillermo del toro , movies , pacific rim , reviews » Review of PACIFIC RIM: this summer's most fun movie yet! Review of PACIFIC RIM: this summer's most fun movie yet! Pacific Rim is the most thoughtful and personal film of the kaiju genre since the original Gojira in 1954. It is also one of the remarkably few that give the kaiju themselves their proper respect. Consequently, it's an insanely fun movie which more than deserves your hard-earned entertainment coin! Those movies about giant monsters? Well, the creatures themselves are "kaiju" (Japanese for "giant beast") and few things have been sillier for me to watch in a movie than for those critters to develop "cute" personalities or to clash one-on-one a'la "good guy fights bad guy". To me, that's not true kaiju. A real kaiju film is about massive beasts being not characters at all... but instead, being unstoppable forces of nature. Something above mortal concepts of good and evil. A good kaiju film should be at its heart a disaster movie, not a monster movie. Something that focuses on people and how they face the direness of the situation: sometimes in the right way, sometimes wrong. That's what Gojira (what us Yanks know better as Godzilla) was. Indeed, that movie upped the ante by being serious political commentary by the Japanese about nuclear weapons, less than a decade after the bombings of Hiroshima and Nagasaki. Practically no movie since has presented the kaiju as a thing which cannot be reasoned or negotiated with, or portrayed the human desperation which comes with that. Indeed, to the best of my knowledge only J.J. Abrams' Cloverfield (2008) has really hit the kaiju sweet spot. But now comes Guillermo del Toro (Hellboy, Pan's Labyrinth) with Pacific Rim. And finally we have again the kaiju genre at its very best. I won't be surprise if wind up catching it again twice - at least - during its theatrical run. Pacific Rim is everything a summer blockbuster movie could be... nay, should be. Of all the movies I've seen this summer so far, Pacific Rim easily tops my list of most enjoyable thus far. It's the near future. A rupture in the tectonic plates deep in the Pacific Ocean has caused a portal to open between Earth's universe and somewhere else. Unfortunately things are coming through that portal. Big things. The first Kaiju (as they come to be called, and you pronounce it "kI-joo") arises off the California shore and beats the slats out of San Francisco, destroys the Golden Gate Bridge (for the second time this summer: does this movie and Star Trek Into Darkness have a beef with that town or something?) and kills untold thousands before finally being stopped with a tactical nuke. Unfortunately that Kaiju is just the first of a wave of ungodly monsters striking throughout the Pacific Ocean and bordering countries: Manila, Sydney, Tokyo and more all fall to the Kaiju. In response humanity pools its technology and develops the Jaegers (pronouced "Yay-gurs", German for "hunters"): gigantic robots dwarfing the size of most skyskrapers. Highly articulate, heavily armored and loaded with the latest mega-ordnance, the Jaegers are meant to be mankind's best defense against the Kaiju. Two pilots are needed to control the Jaegers: each neural-linked to each other in a process called "Drifting". When joined, the two pilots share their thoughts and memories and act as a coordinated team as the "brain" of the Jaegers. And pretty soon the pilots come to be treated not just as worldwide heroes, but as global celebrities like athletes and rock stars. Raleigh Becket (Charlie Hunnam) and his brother Yancey (Diego Klattenhoff) are two Jaeger pilots, driving an American Jaeger named Gipsy Danger. They are two of the very best, and nobody "Drifts" as well as the Brothers Becket. But after Yancey is killed during a battle in Alaska, Raleigh leaves the program: thrown into trauma and shock from still being connected to Yancey as he dies. Five years later, Raleigh Becket has thrown himself among the crews laboring to build an enormous sea wall along the American coast. He is approached by Stacker Pentecost: the commanding officer of the Jaeger program (and intensely played by Idris Elba). Seems that with Kaiju attacks getting harder to counter, the sponsoring governments are coming to see the Jaegers as a waste of precious resources (including food, worldwide supplies of which have become horrendously strained by Kaiju attacks) and want to pull the plug. Pentecost starts to pool the remaining Jaegers and all available pilots to a base near Hong Kong. Meanwhile the Kaiju are starting to come through the portal with increasing frequency. They are also getting bigger, stronger, and smarter. I lost count of the number and kinds of Kaiju rampaging through Pacific Rim. They are each given code-names, but they are mostly known as being "Category 3" and "Category 4" much like hurricanes are in the real world. What was far more memorable and entertaining were the Jaegers and their pilots: Raleigh Becket, the father/son Australian team of Herc and Chuck Hansen (Max Martini and Robert Kazinsky) driving Striker Eureka, the Chinese Crimson Typhoon and Cherno Alpha hailing from Russia. Rinko Kikuchi plays Mako Mori: a young woman who desires to co-pilot a Jaeger but who Pentecost is reluctant to put in the cockpit. These characters and others were what gave Pacific Rim the much-enjoyable heart and soul beneath its monstrous metal and flesh: watching the camaraderie and even rivalry between the Jaeger pilots. Seeing how some have turned dead Kaiju organs into highly lucrative items for black market sale, notably underground merchant Hannibal Chou (Ron Perlman, always a pleasure to behold especially as someone starting to show serious chops as villains lately). And especially the moments of humor perfectly delivered by a "mad scientist" duo of Kaiju researchers played by Charlie Day and Burn Gorman. But hey, chances are strong that you're going into Pacific Rim wanting to look at giant monsters and robots beating the crap out of each other. We get that in spades with Pacific Rim. The battles between the Kaiju and the Jaegers are easily the most devastating and realistic ever portrayed on film: think of what we saw in The Avengers last year and then in Star Trek Into Darkness and Man of Steel this summer, combined, multiplied by twelve (did Farmers, Progressive and Nationwide miss out on some marketing tie-in opportunities or what?). The action spans the width and breadth... and depth... of the Pacific basin. This ain't your granddaddy's "man in rubber suit" monster movie, but it's not seemingly random acts of destruction from too many CGI-rendered blockbusters we've seen lately, either. This is mass carnage with attitude and intellect behind it. And it is positivalutely gorgeous to behold on a big screen! I loved Ramin Djawadi's score: it sets and maintains the perfect tempo for Pacific Rim's high-caliber action as well as its quieter, more human moments. Djawadi has made quite a name for himself in the past few years, between projects like Iron Man and his current work on HBO's Game of Thrones. I haven't gone looking for the soundtrack yet but rest assured, I shall be soon. Pacific Rim didn't just reach my expectations. It raised its claws up, grabbed them and pummeled them into the ground while blowing my eyedrums and earballs with mind-blowing spectacle and shock. Guillermo del Toro and his team have produced an amazing piece of work with Pacific Rim. It may not have pioneered the kaiju genre, but it certainly is the first modern movie to tackle it with honor, with dignity, and with heart. It wouldn't surprise me if this winds up the highest-grossing film of 2013's summer season. Pacific Rim gets the craziest biggest recommendation that I can think of giving a movie! Go see it and go see it big! And don't be afraid to let loose and cheer on the Jaegers, whichever one you find yourself liking the most. There sure was a bunch of applause for them from the audience I was sitting in last night! Oh yeah: do NOT get up to leave after the final scene of the movie. Let those neat 3D depictions of the Jaegers and the Kaiju roll while Djawadi's theme plays, waiting for the "Pacific Rim" title to show. Then see what happens next. Trust me: it's worth sticking around for.